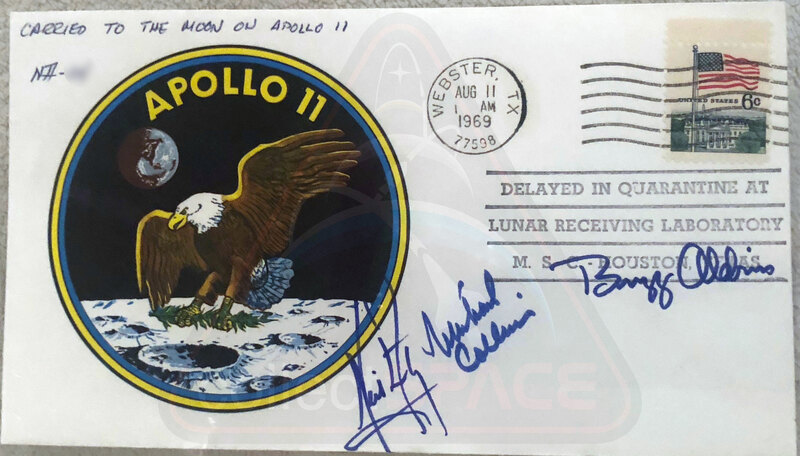 Does anybody of you know whether Neil Armstrong marked or numbered his flown covers? Did anybody ever see one of them? Any idea, where they may be now? I also wonder whether Neil Armstrong did a trial cancellation of the Apollo 11 Moon postmark for himself. Buzz Aldrin and Mike Collins got one each. There was an unflown cover in the recent Astronaut Scholarship Foundation auction that had provenance to the Armstrong family. I believe it was the first cover of any type, flown or unflown, offered by the Armstrong family. Others on the this site should have more definitive information. Paul, thank you very much for this hint. I asked my questions to ASF Executive Director. Hopefully, she will pass it to Rick Armstrong. In answer to the question about the flown Armstrong covers, yes they are numbered. Regarding the practice cancellation (which was done on the back of a flight plan page), yes there is one. Rick a few of us were discussing the ASF cover that was donated. To our knowledge that was the first and only letter cover from your family collection to come available anywhere. Is that correct? Rick, thank you very much for quick information. Buzz Aldrin numbered his flown covers EEA-1 to EEA-52 and A-58 to A-104. We do not know what is between. Michael Collins remarked on his flown covers "Carried to the Moon aboard Apollo 11". He numbered them with C-1 to C-63 on the picture of earth. In which way did it your father? I don't recall exactly, will have to get back to you on that. Rick, did you already have time to look how your father numbered his covers flown to the moon? Are most of them covers from NASA Manned Spacecraft Center Stamp Club as are most insurance covers as well as most moon-flown covers from Buzz Aldrin and Mike Collins? Sorry for the late reply - he used "NA-x" (where x is the number) in the upper left corner. Rick, Thank you very much. Your answer comes right. I am finalizing my catalogue in February. Did anybody ever see a "NA-X" cover, and what else was added? Would it be possible to see one of them? In answer to the question as to whether anyone has ever seen one, the only one that I've ever seen was long ago in an exhibit by Ben Ramkissoon. Not many of us could afford one of these. Ray, I thought Neil Armstrong never parted with any of his flown covers or unflown insurance covers. Walter - Ben's cover was not a Neil Armstrong cover but one from Buzz Aldrin. It would be nice to have a picture in the new book I'm finalizing (see here), in which also there is a full chapter on the "philatelic aspects of Apollo 11." $18,251 was the winning bid, I believe. Thank you for the link. What I was referring to is a flown cover, which — according to what has been clarified by Rick Armstrong — was numbered in the upper left corner as "NA-x". It seems they have never been publicly seen. This is the first time I ever see such a cover and I think this is also the first time a flown cover from the Armstrong family is shown in public. The upcoming November Heritage auction includes one of these covers, #28 specifically, encapsulated in a special Armstrong family collection holder.